Polyvinyl Alcohol (PVA) Water Soluble Films Market to Receive Boost from Agrochemical Packaging ApplicationsThe new report titled “Polyvinyl Alcohol Films Market - Global Industry Analysis, Size, Share, Growth, Trends and Forecast, 2012-2018” published by Transparency Market Research, estimates the global demand for PVA films for water soluble applications to be 15,500 tons for 2010. This volume increased to 16,027 tons in 2011. In terms of revenue, the global market for PVA films used in water soluble applications is expected to grow at a CAGR of 4.8% from 2012 to 2018 and that for PVA films used in polarizer applications is likely to grow at a CAGR of 4.3% from 2012 to 2018. PVA films are primarily used in industrial and household applications for packaging of harmful chemicals such as pigments, dyes, detergents, and bleaches. They are also used in polarizer applications that include sunglasses, LCD panels, lenses and optical filters, among many others. Polyvinyl alcohol (PVA) film also finds its wide use in the production and packaging of polarizer film. Their use in various water soluble applications such as agrochemical and detergents packaging is widespread. 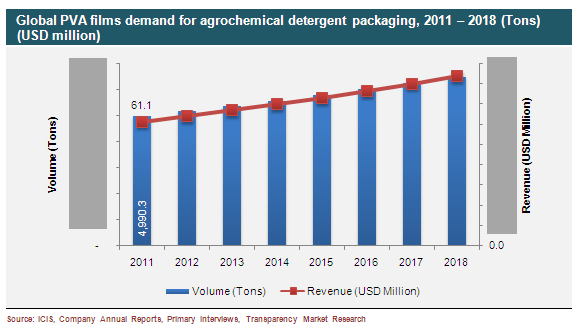 The demand for PVA water soluble films in agrochemical packaging segment is expected to rise at a CAGR of 3.8% from 2012 to 2018. Furthermore, in terms of revenue, the market is expected to reach a value of US$83.6 million by 2018. This study report segments the application of PVA films into two main categories water soluble applications and polarizer applications. Some of the major water soluble applications analyzed in the report include laundry bags, embroidery, detergent packaging, agrochemical packaging, and others. Polyvinyl alcohol film is basically a water soluble biodegradable film that helps water soluble small dose packaging of agrochemicals, dyes, detergents, and water treatment chemicals. The small water soluble doses avoid human contact and offers ease-of-use too. This versatile polymer has extremely high resistance to oil, grease, and solvents, and excellent tensile strength, aroma barrier, oxygen and flexibility. Polyvinyl alcohol (PVA) is a synthetic polymer with excellent adhesive, emulsifying properties, film-forming, and high water soluble qualities. PVA films primarily find its application in a wide range of industries. The packaging and manufacturing of liquid crystal display (LCD) panels has penetrated the market immensely in the recent past. This market segment is also on the rise due to its biodegradable nature. Moreover, PVA is used in the agriculture sector for packaging of herbicides or small doses of pesticides which are likely to cause harm to humans. PVA films are further utilized in seed tape that absorbs water from soil during regular intervals and facilitates germination. Apart from packaging applications, PVA films are widely used as water soluble films for embroidery and laundry bags applications. Some of the additional emerging applications of PVA films include water transfer printing and food packaging that further involves food products like chocolate, coffee and more. The study report based on the market for polyvinyl alcohol (PVA) film also highlights the importance of polarizer as another major application of PVA films. Some of the major companies profiled in this study report include MonoSol, LLC, AMC (UK) Ltd., Changzhou Water Soluble Co. Ltd, Sekisui Specialty Chemicals, Arrow Coated Products Ltd., Jiangmen Proudly Water-Soluble Plastic Co., Ltd., Cortec Corporation, Nippon Gohsei, Kuraray Co. Ltd., and Aicello Chemical Co. Ltd.